Aspirants should have completed 10th class/intermediate with 50% of marks from any recognized university. Candidates Age limit should be in a middle of 15 to 24 years as on 01st October 2018. Upper age Limit will be applicable by 03 years for OBC category, 05 years for SC/ST category and 10 years for PWD category. Rs. 5700/- for 1st year, Rs. 6500/- for 2nd years and Rs. 7350/- for 3rd year. 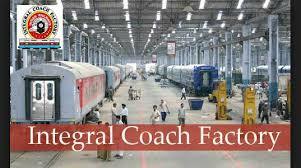 o Log on to ICF careers page at the official website www.icf.indianrailways.gov.in. o Eligible candidates are advised to open the online application form. o Attach self-attested copies of all relevant documents in prescribed format and size. o Pay the application fee as per the category. o Complete the ICF Jobs Application Form with the essential data. o Check the Details before Submitting. o Take a print out of ICF Recruitment 2018 online application form.